Background Content: This case study examined the effects of a single Prolotherapy injection series on the left iliolumbar ligament. The ligament measurements were split between medial and lateral portions of the iliolumbar ligament and we hypothesized that growth would occur increasing the cross sectional area and thus provided added stability to the pelvis and lumbar spine. Purpose: The purpose of our study was to answer two questions: 1) how do you know that the Prolotherapy injectant actually reaches the ligamentous structure you are attempting to heal; and 2) how long does it take for the ligament to recover? Methods: One subject, 32 year-old female with no history of lower back pain (LBP) participated in our study. Her job tasks as a physical therapist required her to twist turn and bend; putting pressure on her pelvis and ligamentous system. 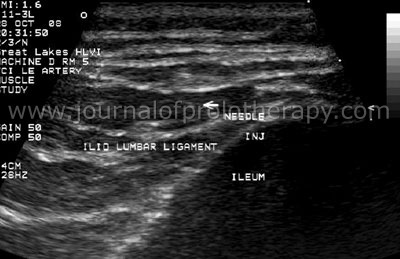 The primary author (A.A.) assessed her pelvic ligaments which lead to using a specified Prolotherapy solution for the left iliolumbar ligament. Ultrasound (US) guided imaging was used to take baseline measurements of the left iliolumbar ligament prior to Prolotherapy. Bi-weekly US measurements were up to six weeks to determine cross-sectional area (CSA) changes within the ligament. Results: The results indicated that after the initial Prolotherapy treatment, there was growth in the left iliolumbar ligament at both the medial and lateral sites. The CSA increased by 27% for the medial measurement and 21% for the lateral measurement compared to baseline. The left iliolumbar ligament also appeared to change its characteristics and looked more uniform as a result of one Prolotherapy treatment. Conclusion: Patients that experience lower back pain and or pelvic shifting may benefit from the usage of Prolotherapy to strengthen the ligaments surrounding their pelvis. Our study also brings out the positive effects of using US to capture changes that occur within specific tissue. In order for information to become pertinent and cogent to a specific medical community, it needs to become valid, reliable and reproducible.1 The complaints of lower back pain (LBP) are frequent at a physician’s office2 and as the body ages so do the structures that support it (i.e. disc, muscles and ligaments).3 Degenerative disc disease is still the leading lower back diagnosis in the United States.4 However, the lack of a specific patho-anatomic diagnosis in many cases of low back pain has led to the development of alternative diagnostic schemes. One example is the treatment-based classification system proposed by Delitto et al.5-6 We too suspect that diagnostic accuracy is improved by determining what structure or structures are responsible for the origin of the patient’s symptoms. Auburn, et al7 has shown that ligamentous structures can generate pain and cause referral patterns that mimic discogenic pain patterns, as originally reported by Hackett in the 1960s and replicated by Hauser in 2004. Ligament involvement can be confirmed by the changes in symptoms following treatment by Prolotherapy. 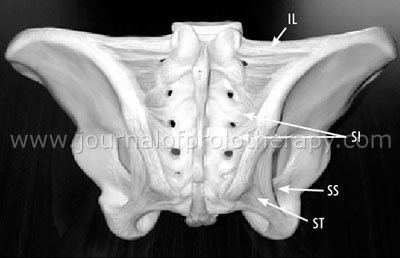 The passive ligament system of the pelvis is very strong and will stabilize the sacrum and pelvis against unwanted motion.8 The ligaments that are primarily responsible for control of lumbopelvic motion are the iliolumbar ligament (IL), the long dorsal sacroiliac ligament (SI), the sacrospinous ligament (SS) and the sacrotuberous ligament (ST). (See Figure 1.) The iliolumbar ligament will stabilize L4 and L5 on the ilium and sacrum and is considered a very important pelvic stabilizer.9-10 The SI, SS and the ST help stabilize the pelvis and subsequently will keep the lumbar spine in check as well.9, 11 When there is a disruption in one of the lumbopelvic ligaments, poor control of lumbopelvic motion and muscular imbalances are the result.12 When this disruption occurs, the clinician needs to determine which ligament is affected so that effective treatment can be applied to help restore normal stability and decrease pain. Figure 1. A pelvic model with ligaments labeled. Effective treatment for ligament strengthening via cell restoration is called Prolotherapy. This treatment dates back to the 1950s and 1960s when its pioneer Dr. G.S. Hackett discovered that by injecting a hypertonic sugar solution into a painful ligament, a patient’s LBP was reduced.13-15 Two questions that arise from the cell proliferation procedure are 1) how do you know that the Prolotherapy injectant actually reaches the ligamentous structure you are attempting to heal; and 2) how long does it take for the ligament to recover? The purpose of our study is to answer these questions using the iliolumbar ligament as a model. We used Ultrasound (US) technology to inject the ligament under guidance and to quantify the changes in ligament shape and substance from week to week. Figure 2. 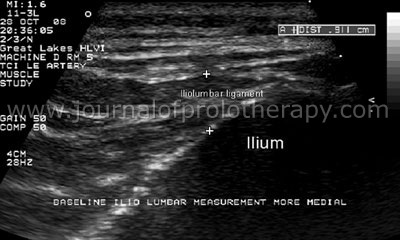 US image showing the iliolumbar ligament and the ilium. The arrows show the ligaments striations (dark and whitish tissue). This study was conducted at Ingham Regional Medical Center in Lansing, Michigan and was reviewed and approved by the board at the Natural Health and Improvement Center. One female, 32 year old, 5’6, and 60 kg was included in this study. She had no history of LBP nor did she have any surgery or lower back procedures performed for pain control. She worked as a physical therapist and performed bending and twisting activities during her daily treatment of patients. She had two children but did not experience lower back pain as a result of her pregnancies. Figure 3. US technician and subject with the US probe being placed on the left side of the low back. Figure 4a. 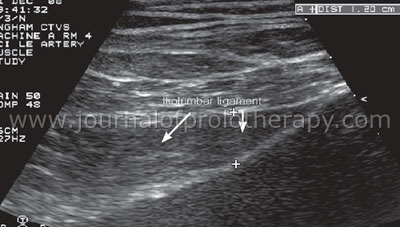 Baseline lateral US image for the left iliolumbar ligament is shown. The cross sectional area is between the plus (+) signs. Figure 4b. 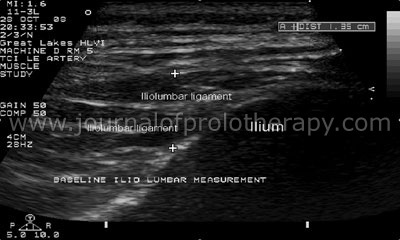 Baseline medial US image for the left iliolumbar ligament is shown. The cross sectional area is between the plus (+) signs. Whittaker33 points out that the muscle tissue appears darker with US due to the larger amount of blood it contains, and fascia or ligamentous structures appear lighter, reflecting their increased density and lower fluid content. The iliolumbar ligament is thus referred to as hyperechoic compared to the hypoechoic muscle tissue.16-34 In order to determine any changes within the ligament being looked at, we had to apply the above parameters as well as the following, in order to give the study some true quantitative objectives. Each time we imaged, we duplicated the exact settings on the same ultrasound equipment, the Philips Sonos 5500 using the 3.5 MHZ curved linear array probe. We used the same gray scale map with B-Mode imaging, consistent depths, as well as consistent patient positioning. When evaluating the ligament for any cross sectional area measurement changes or tissue integrity we made comparable measurements from one session to the next with review of previous imaging. Figure 5a. 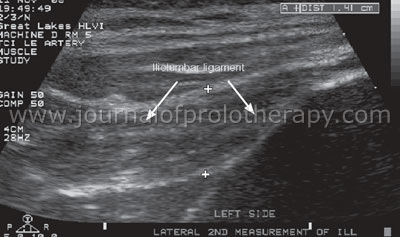 US illustration showing the needle, ilium, iliolumbar ligament prior to the Prolotherapy injection material moving into the iliolumbar ligament. Figure 5b. Iliolumbar ligament site as indicated by the X and the needle placement. The US technician took measurements for the lateral and medial sections of the left iliolumbar ligaments pre-injection, after one week, then, every two weeks. There were four measurements in total for the duration of six weeks from the time of the baseline measurement. One week after a single series of Prolotherapy injections, there was cross sectional growth in the iliolumbar ligament compared to baseline, although most dramatic growth in the ligament was recorded during weeks two through four. At the six week mark, the growth leveled off for the lateral portion of the left iliolumbar ligament, but the medial side of the ligament still showed signs of further tissue proliferation. (See Table 1.) Total growth in the left iliolumbar ligament for the medial portion was a positive 27% from the initial measurement at six weeks post-injection. The lateral section of the ligament also grew by 21% from the initial baseline measurement. (See Table 1.) 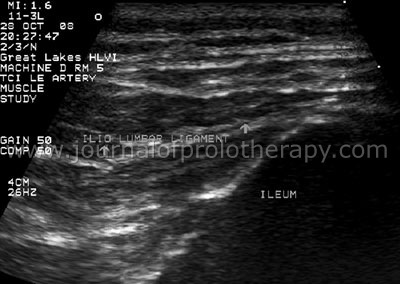 Thus the cross sectional area of the left iliolumbar ligament in this subject improved from one series of Prolotherapy injection material. Table 1. Iliolumbar ligament measurements from baseline. Other researchers, Young, et al46 used US to measure the quadricep muscle comparing tape measure versus US measurement. They concluded that the US proved to be far superior to most clinical measures, specifically, allowing clinicians to visualize quadriceps muscle wasting when very little wasting was demonstrated with the tape measure method. Thus US can help a clinician understand with high sensitivity, if a certain tissue has undergone changes, and whether those changes are positive or negative. Our findings showed the effectiveness of using Prolotherapy solution to specifically target a designated structure. Our question of whether or not the material actually made its way into the ligament was answered using US technology, since we directly visualized the bolus of injectant entering the tissue. The results showed that the cross sectional area increased in both the medial and lateral portions of the left iliolumbar ligament. The left iliolumbar ligament was measured on a bi-weekly basis to determine if there was growth in both locations. Loukas47 determined how to best visualize the iliolumbar ligament with US, and we employed his ideas to show the changes in the tissue structure over a six week period of time. We did not scan the deep sacroiliac ligamentous structures because of poor visualization of landmarks and inability to accurately measure cross sectional changes. Further research in this area is needed to help identify and treat the ligamentous structures around a person’s pelvis that may be contributing to their pain. Within a week after one Prolotherapy series, the ligament began to increase in cross sectional area and this continued for at least part of the ligament up to the last measurement at six weeks. We hypothesize from this that one series of Prolotherapy (using the reported materials) caused the body to ramp up cellular growth as suggested by Reeves.48 Thus, we concluded that one series of injections is sufficient to enhance the stabilizing function of the left iliolumbar ligament and subsequently give the lumbar spine and pelvis increased support. It appears that after six weeks, to maintain ligament hypertrophy, we would need to introduce further solution. Our finding demonstrated that the iliolumbar ligament appeared to change in how it presented from week one to week six. (See Figures 6a–f.) This finding is separate from the fact that the cross sectional area of the ligament positively increased in size from week one to week six. Our findings are encouraging from many points of view. The first positive effect was that it took only one series of injections to cause a change in a tissue structure. Secondly, we saw that the left iliolumbar ligament appeared differently (more uniform) over the six weeks that the measurements were taken. Lastly, US technology has been shown to be able to visualize the Prolotherapy solution as it is being injected, and can also aid in showing the changes that occur from the Prolotherapy solution. With the array of chemical mixtures for Prolotherapy available today, it would be interesting to see what effects those proliferents would have on various tissues using US technology to monitor cross sectional area changes and tissue growth. In our case, we were not concerned about pain, but only with what effect Prolotherapy would have on the tissues that support the lumbar spine and pelvis. Our positive findings move us one step closer to showing how, for patients with lower back pain, Prolotherapy can prove to be a good adjunct to increase stability in the lumbar spine and pelvis. Figure 6a. 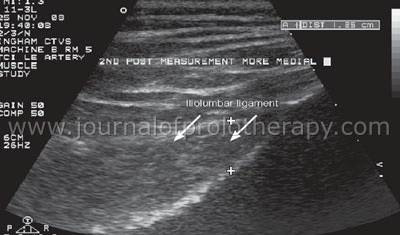 US illustration of the left iliolumbar ligament, medial portion at 2 weeks from baseline. The cross sectional area is between the (+) signs and the striations are shown in the iliolumbar ligament. Figure 6b. 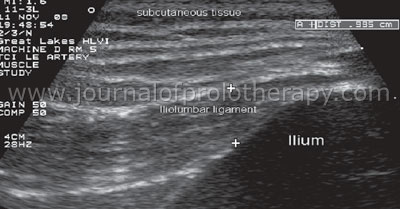 US illustration of the left iliolumbar ligament, lateral portion at 2 weeks from baseline. The cross sectional area is between the (+) signs and the striations are shown in the iliolumbar ligament. Figure 6c. US illustration of the left iliolumbar ligament, medial portion at the 4 week mark from baseline. The cross sectional area is shown between the (+) signs and the striations are shown. The delineation line between the ilium and the iliolumbar ligament is shown by the white line; the ligament is becoming more hyperechoic. Figure 6d. 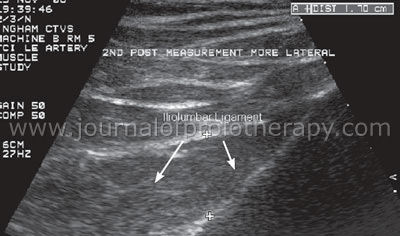 US illustration of the left iliolumbar ligament, lateral portion at the 4 week mark from baseline. The cross sectional area is shown between the (+) signs and the striations are shown. The delineation line between the ilium and the iliolumbar ligament is shown by the white line; the ligament is becoming more hyperechoic. Figure 6e. 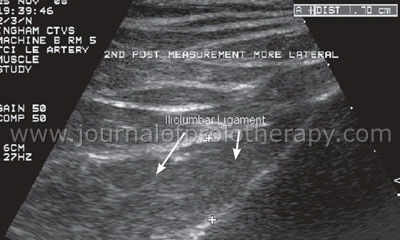 US Illustration of the left iliolumbar ligament, medial portion at the 6 week mark from baseline. The ligament tissue as shown is more hyperechoic (lighter) and more defined compared to the previous illustrations. Figure 6f. US Illustration of the left iliolumbar ligament, lateral portion at the 6 week mark from baseline. The lateral portion is also more hyperechoic (lighter) and the delineation line between the Ilium and the ligament is much defined as shown by the white line. Strauss SE, et al. Evidenced-Based Medicine; How to practice and Teach EBM. (3rd edition) Churchill Livingston: Philadelphia: 2005. Sasso RC, et al. Prospective, randomized trial of metal-on-metal artificial lumbar disc replacement: initial results for treatment of discogenic pain. Spine. 2008; 33(2):123-31. Kim MS, et al. Recurrence rate of lumbar disc herniation after open discectomy in active young men. Spine. 2009; 34(1): 24-9. Frymoyer JW. Lumbar disk disease: epidemiology. Instr Course Lect. 1992; 41: 217-23. Delitto A, et al. A treatment-based classification approach to low back syndrome: identifying and staging patients for conservative treatment. Phys Ther. 1995;75(6): 470-85. Buchner M, et al. The influence of the grade of chronicity on the outcome of multidisciplinary therapy for chronic low back pain. Spine. 2007; 32; 26: 3060-6. Auburn A, et al. Prolotherapy for pelvic ligament pain; a case report. The Journal of Prolotherapy. 2009; 1:2 89-95. Chow DH, et al. Torsional stability of the lumbosacral junction. Significance of the iliolumbar ligament. Spine. 1989; 14; 6: 611-5. Yamamoto I, et al. The role of the iliolumbar ligament in the lumbosacral junction. Spine. 1990; 15; 11: 1138-41. Dujardin FH, et al. Experimental study of the sacroiliac joint micromotion in pelvic disruption. J Orthop Trauma. 2002; 16; 2: 99-103. Snijders CJ, et al. The influence of slouching and lumbar support on iliolumbar ligaments, intervertebral discs and sacroiliac joints: Clin Biomech. (Bristol, Avon) 2004; 19; 4: 323-9. Hackett GS. Prolotherapy in whiplash and low back pain. Postgrad Med. 1960; 27: 214-9. Hackett GS, et al. Prolotherapy for sciatica from weak pelvic ligaments and bone dystrophy. Clin Med. (Northfield IL) 1961; 8: 2301-16. Hauser RA. Punishing the pain. Treating chronic pain with Prolotherapy. Rehab Manag. 1999; 12; 2: 26-8, 30. Whittaker JL. Ultrasound Imaging for Rehabilitation of the Lumbopelvic Region; A Clinical Approach. Churchill Livingston: Philadelphia: 2007. Whittaker JL, et al. Rehabilitative ultrasound imaging: understanding the technology and its applications. J Orthop Sports Phys Ther. 2007; 37(8): 434-49. Teyhen DS, et al. Rehabilitative ultrasound imaging of the abdominal muscles. J Orthop Sports Phys Ther. 2007; 37(8): 450-66. Wallwork TL, et al. Intrarater and interrater reliability of assessment of lumbar multifidus muscle thickness using rehabilitative ultrasound imaging. J Orthop Sports Phys Ther. 2007; 37(10): 608-12. Whittaker JL, et al. Rehabilitative ultrasound imaging of pelvic floor muscle function. J Orthop Sports Phys Ther. 2007; 37(8): 487-98. Fullerton BD. High-resolution ultrasound and magnetic resonance imaging to document tissue repair after Prolotherapy: a report of 3 cases. Arch Phys Med Rehabil. 2008; 89(2): 377-85. Whittaker AD, et al. Principles of ultrasound and measurement of intramuscular fat. J Anim Sci. 1992; 70(3): 942-52. Stokes M, et al. Rehabilitative ultrasound imaging of the posterior paraspinal muscles. J Orthop Sports Phys Ther. 2007; 37(10): 581-95. Hides JA, et al. Effect of stabilization training on multifidus muscle cross-sectional area among young elite cricketers with low back pain. J Orthop Sports Phys Ther. 2007; 38(3): 101-8. Hides JA, et al. Evidence of lumbar multifidus muscle wasting ipsilateral to symptoms in patients with acute/subacute low back pain. Spine. 1994; 19(2): 165-72. Hodges P, et al. Rapid atrophy of the lumbar multifidus follows experimental disc or nerve root injury. Spine. 2006; 31(25): 2926-33. Loukas M, et al. Iliolumbar membrane, a newly recognized structure in the back. Folia Morphol. (Warsz) 2006; 65(1): 15-21. Bunce SM, et al. M-mode ultrasound: a reliable measure of transversus abdominis thickness? Clin Biomech. (Bristol, Avon) 2002; 17(4): 315-7. Kidd A, et al. Reliability of real-time ultrasound for the assessment of transversus abdominis function. J Gravit Physiol. 2002; 9(1): P131-2. McMeeken JM, et al. The relationship between EMG and change in thickness of transversus abdominis. Clin Biomech. (Bristol, Avon) 2004; 19(4): 337-42. Bunce SM, et al. Measurement of abdominal muscle thickness using M-mode ultrasound imaging during functional activities. Man Ther. 2004; 9(1): 41-4. Auburn A, et al. Prolotherapy for pelvic ligament pain; a case report. The Journal of Prolotherapy. 2009; 1:2: 89-95. Young A, et al. Measurement of quadriceps muscle wasting by ultrasonography. Rheumatol Rehabil. 1980; 19(3): 141-8. Reeves KD, et al. Pain Procedures in Clinical Practice, 2nd Edition; Prolotherapy: Basic Science, Clinical Studies, and Technique. Hanley & Belfus, Inc.: Philadelphia: 2000: 172-190.